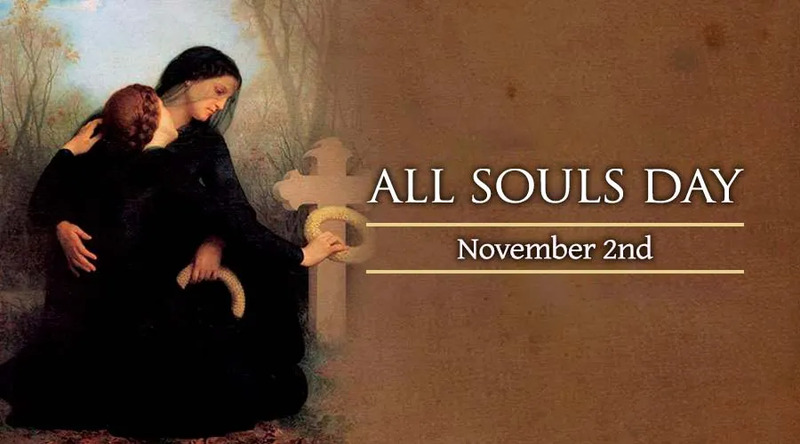 The commemoration of all the faithful departed is celebrated by the Church on November 2, or, if this falls on a Sunday or a solemnity, the feast is celebrated on November 3. The Office of the Dead must be recited by the clergy on this day, and all the Masses are to be of Requiem except one of the current feast, where this is of obligation. The theological basis for the feast is the doctrine that the souls which, on departing from the body are not perfectly cleansed from venial sins, or have not fully atoned for past transgressions, are debarred from the Beatific Vision, and that the faithful on earth can help them by prayers, almsgiving and especially the sacrifice of the Mass. In the early days of Christianity the names of the departed brethren were entered in the diptychs. Later, in the sixth century, it was customary in Benedictine monasteries to hold a commemoration of the deceased members at Whitsuntide. In Spain there was such a day on Saturday before Sexagesima or before Pentecost, at the time of Saint Isidore (d. 636). In Germany there existed (according to the testimony of Widukind, Abbot of Corvey, c.980) a time-honoured ceremony of praying to the dead on October 1. This was accepted and sanctified by the Church. Saint Odilo of Cluny ordered that the commemoration of all the faithful departed be held annually in the monasteries of his congregation. From here, it spread among the other congregations of the Benedictines and among the Carthusians. Of all the dioceses, Liège was the first to adopt it under Bishop Notger (d. 1008). It is then found in the martyrology of Saint Protadius of Besançon (1053-66). Bishop Otricus (1120-25) introduced it into Milan for October 15. In Spain, Portugal, and Latin America, priests say three Masses on this day. A similar concession for the entire world was asked of Pope Leo XIII; he would not grant the favour, but ordered a special Requiem on Sunday September 30, 1888. Source: Catholic Encyclopedia, Copyright 1907.